Several years ago, Garber Park Stewards and Golden Hour Restoration Institute first tossed around the idea of creating an interpretative brochure that would enrich the experience of visiting Garber Park. We wanted to create a document that was engaging and informative for all park users—first timers as well as regular visitors. if you haven’t delved into the wonders of Garber Park, you need to know about it! You will find a delightful native oak woodland with native fern grottoes, giant coast live oaks, California buckeyes, California big leaf maples, and a fascinating old defunct replace from old boy scout days of the 1920’s! All this is within walking distance from the intersection of Ashby and Claremont avenues. Thank You CAL Students: More than 20 UC Berkeley students joined us on October 28th to celebrate Berkeley Day working on trails in Claremont Canyon. Together we cleared trails, pulled French broom, widened the narrow portions of the new Gwin Canyon Trail and began installing steps on the steeper portions. Lots was accomplished and the trails are in great shape. Berkeley Day happens twice a year and the Conservancy has had students involved in these efforts for several years. Claremont Canyon is an example of how teamwork pays off. Thank you to the students, the Eagle Scouts and to all our volunteers for their past and present efforts. Tim Wallace considers himself a “Yes man”—not a person that caves into other people's demands, but the kind that says, “Yes” to life. Tim has been involved with natural resources all his life: first as rancher and logger, then later in academics. He has been at UC Berkeley since 1963. "I've worked at the White House on agricultural matters and was Director of California's Department of Food and Agriculture. I've done consulting abroad in Europe, Latin America, Africa, the Far East, and New Zealand and Australia." Saturday, May 18, 2002 was the dedication of the Ralph Samuel bench at the Claremont Canyon Regional Preserve. Ralph was the District’s Land Acquisition Specialist from 1979 to 1986. Hulet Hornbeck, Land Department Chief, originally hired him to acquire the privately owned lots that were included in the Claremont Canyon Preserve. Chief Ken Pimlott was appointed Director of CAL FIRE by Governor Jerry Brown in 2011 after an outstanding, 30-year long career in state re protection programs. As Chief of CAL FIRE and also California’s State Forester, Mr. Pimlott is responsible for 237 fire stations, 39 conservation camps, 12 air attack, and 10 helitack bases. General Manager Robert Doyle began his park career over 40 years ago as a member of the East Bay Regional Park District’s eucalyptus crews, following the big freeze of 1972. He went on to serve in several eld, planning, and administrative positions before becoming Assistant General Manager for Land Acquisition and Planning in 1990. For the next 21 years he led the District’s expansion of parklands to serve the rapidly growing populations of Alameda and Contra Costa counties. In 2010, he was appointed General Manager by the Park District’s seven-member, elected Board of Directors to oversee 70 regional parks totaling 124,000 acres, 1,200 miles of interconnecting trails, and a staff of 1,000 employees. Refreshments and wine bar. Invite a friend or neighbor. The Annual Meeting of the Claremont Canyon Conservancy will be held again at the Claremont Hotel in the Sonoma Room, second floor. All are invited to attend free of charge. After light refreshments and brief updates from the board, we will hear from our two invited speakers, both East Bay residents who have risen to leadership positions in key agencies that have direct impact on the management of public lands and protection of residents. We will first hear from Robert Doyle, General Manager of the East Bay Regional Park District, followed by Ken Pimlott, Director of CAL FIRE. They will update us on their agencies’ efforts to improve fire safety in the East Bay Hills, and the role of the coordinating body, the Hills Emergency Forum, in fostering interagency communication. Please come hear what these experts have to share with us, and stay for the questions and answers afterward. Be sure to RSVP, as we expect a strong turnout. We had some big excitement last week. Because of the Grizzly Peak Fire on Wednesday afternoon, we had to cancel our workday. We did get back to Skyine on Sunday and almost finished with Scattergrass in the Bay Grove. Perhaps one more good session will finish that off . . .
Botanists tend to love a fire, because the aftermath is so fascinating. Seeds not seen in decades may sprout. In the early days of California botany, when Jepson was at Cal in the early 1900's, he and others found scores of interesting natives on the slopes of Grizzly Peak. Will they return? How will UC manage the burn area (let's hope they do nothing besides remove the Eucs and Pines)? "I attended the 8/2/2017 fire Oakland Hills fire scene during operations today and observed conditions and took photos. The City of Berkeley Fire responded, as did many other agencies. The fire would have threatened Berkeley, except that the winds were blowing onshore from the ocean. Imagine if the winds were blowing down the canyon (off-shore), as we see during Diablo Wind condition days. The most effective response came from helicopter water drops, taken from lake Anza, by EBRPD, Cal Fire and other attending helicopters. Most of the firefighters stayed on Grizzly Peak, as the hills are too steep and littered with dead eucalyptus and pine fuel." I thought you might like to hear from a fire fighter and her mom's perspective. Kerry, my daughter, was a part of the fire fighting crews from EBMUD (every EBMUD ranger is trained in fighting urban interface fires.) They were at the scene in Strawberry Canyon a very few minutes after it started. Berkeleyside: first day coverage is here. This spring, we cover a new group, Take To The Hills, working on trails in the little canyon that runs parallel to Claremont Canyon. That canyon, and the foot path or “social trail” traversing it, have variously been called Derby, Dwight, Clark Kerr and even (at least once) Rattlesnake Canyon/Trail. Along with T3H, we are asking the agencies that own the land to settle on a name that will stick. For now, we agree with T3H that the historic name of Derby, in honor of Derby Creek whose headwaters begin in that small canyon, makes sense. 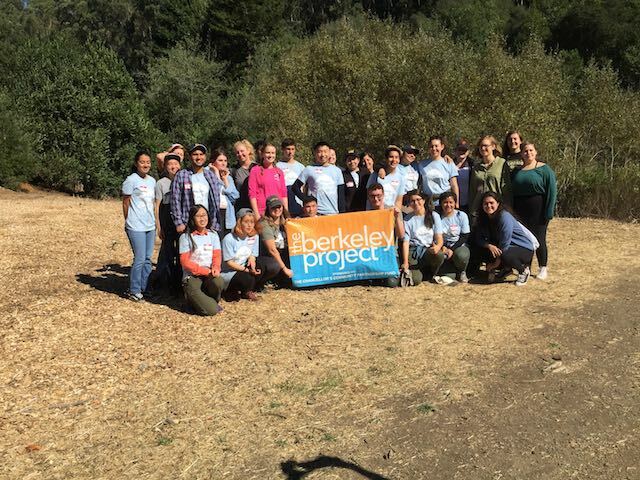 Earlier this spring UC students joined with regular Conservancy volunteers to participate in the semi-annual Berkeley Project Day. Recent rains had made Claremont Canyon sport new green foliage, but also left portions of our upper canyon trails muddy and . . .
At the invitation of the Conservancy, in 2009 members of the California Lichen Society surveyed lichens at sixteen sites in Claremont Canyon. Read a report of the survey in the Conservancy’s Fall 2009 Newsletter. In all, 81 lichen species were identified. The results of the survey . . .